Samsung Galaxy Note 7 Leaks Roundup: Every Rumor We Know about Galaxy Note 7 So Far! The world is eagerly waiting to see a glimpse of the next version of Samsung Galaxy Note 7 and obviously its high-end specifications. 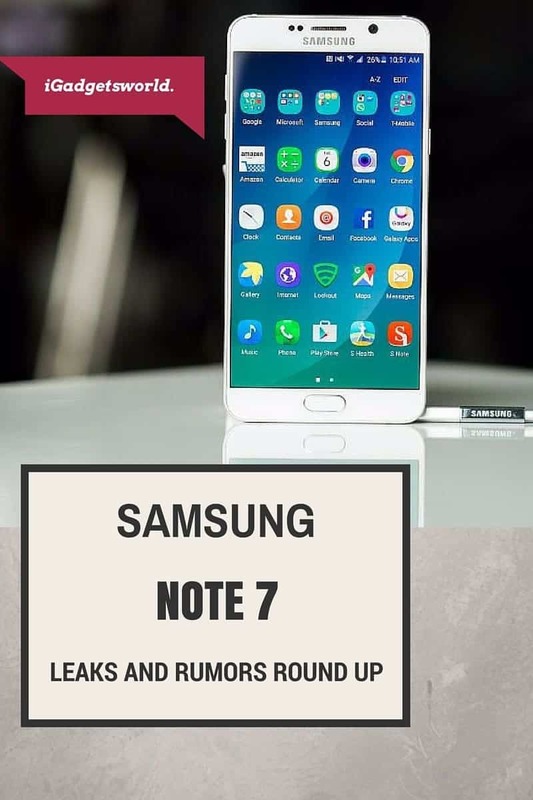 As per the recent leaks, it is anticipated that the Note 7 comes with top notch out-of-box specifications making the smartphone be the best smartphone of the year 2017. let’s have a brief view on all the Samsung Galaxy Note 7 leaks roundup. 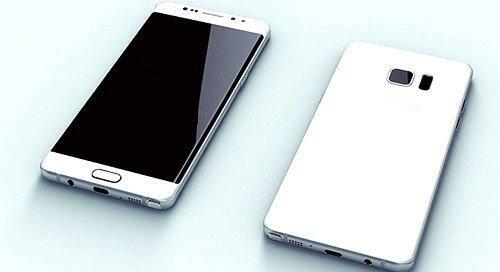 As per the recent leaks and rumors over the internet about the Note 7; it is reported that the phablet will come with a curved display with a 5.7-inch QHD screen, 6GB RAM, 64/128/256GB storage options, 12MP/5MP camera combo, and 3600 mAh battery. Samsung has already proved to blend innovation in its every range of products and the same expectations are being speculated in the Samsung Galaxy Note 7. There are already so many rumors and alleged speculations relating to the Galaxy Note 7. Judging from the release dates of the previous Note devices, the Note 7 is expected to release during the first six months of 2017. 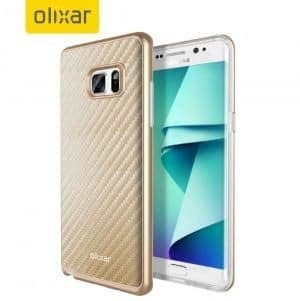 The exact Galaxy Note 7 release date, however, cannot be ascertained as of now yet. As per the Russian website and from the Russian leakster “Eldar Murtazin“, who has been responsible for a few credible leaks in the past. He is now responsible for the recent leak on Note 7. As per his tweet, the Note 7 will be officially announced at Samsung’s unpacked event on August 2nd. He also reported that Galaxy Note 7 will be capable of pushing 20 hours of video at maximum brightness on a single charge and that the battery size will be 3,600mAH, the same size battery found in the Galaxy S7 edge. The next Samsung Unpacked event will reportedly take place on August 2 and will reveal all that we would like to know about Note 7 including whether the next Note will finally be IP-certified or not, along with the screen size, which is said to be curved on both edges and 5.8 inches in size, breaking past the 5.7 inch cycle of the last 3 Galaxy Note iterations. Recently HDBlog released an overview video regarding the TOUCHWIZ UI and a supporting article of how the UI will look like. The new TouchWiz beta has a lot of blur elements throughout and new visual cues that give TouchWiz a whole new look. HDBlog reports the UI is “very simple, straightforward, clean, and less distraction.” There is also talk of a possible iMessage competitor for Samsung users. Let’s wait for the final confirmation regarding the UI of what the Samsung is planning to play with Note 7. Very recently, a new leak on Note 7 revealed some more details on the design part of the smartphone. So far we’ve had a lot of reports saying that Samsung opted to go with a dual-edge display for the Note7. Then again, there were some other rumors telling us that wouldn’t be the case. So what to believe? Well, after having the glance on this cases which were listed in a well known UK based mobile accessory eCommerce website, it is expected that the Note7 will indeed come with a curved display. And, as you can see, the Note7 depicted in these cases definitely has that trademark dual-curved touchscreen, a la the S7 edge. But it also has a stylus (with the slot in its usual place on the bottom side of the device), as you would expect. Speaking of specifications you should expect, the Note7’s resolution is going to be QHD (with a size of 5.7″ or 5.8″), while other rumored specs include 6GB of RAM, 64GB of expandable storage, an iris scanner, IP68 water and dust resistance, a USB Type-C port, the same cameras as the S7 and S7 edge, and a new Exynos chipset with octa-core CPU (replaced with the Qualcomm Snapdragon 821/823 in some markets). With the leak of Note 7 panels, it depicts that the Galaxy Note 7 will have an Iris Scanner. It was rumored many weeks back that Note 7 comes with an iris scanner. 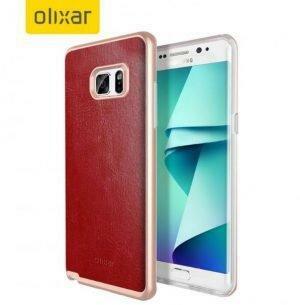 Well, if the front panel that has been leaked recently indeed belongs to the new Note device, then this dilemma is finally settled. Want to know “What is Iris Scanner?” and how Iris scanner will improve the security? Then read about iris scanner here. Take a look at the images above. The first one reportedly shows us the Note7’s front panel, and above the display, you can see three big cutouts that have not been there in previous Samsung handsets. It’s good to see that Samsung has managed to keep the screen’s upper bezel manageable in size despite this addition. It’s also likely that the front Samsung logo was removed in order to keep that bezel as thin as possible, which we’re thankful for. 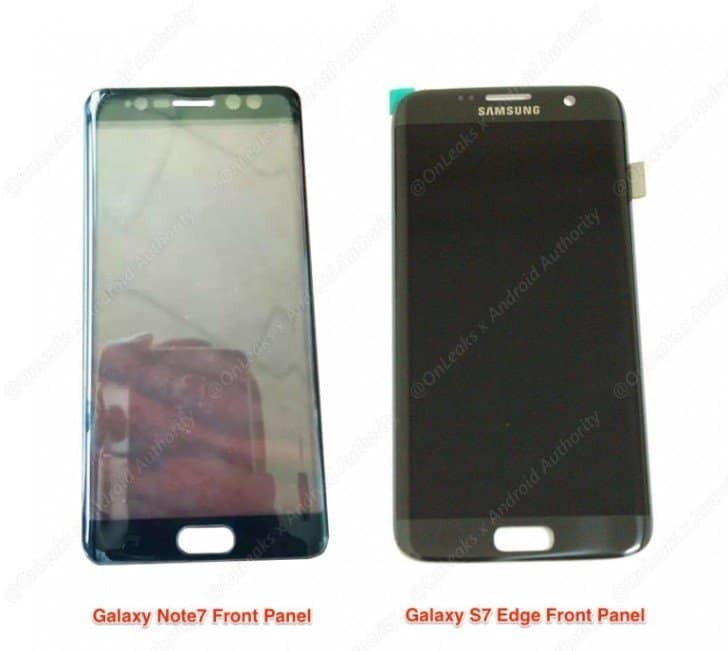 The Galaxy Note7 is rumored to have a 5.8-inch QHD Super AMOLED dual edge display, 6GB of RAM, a 12 MP main camera like the S7 and S7 edge, a new Exynos chip (or the Snapdragon 821/823 in some markets), and a 3,600 or 4,000 mAh battery. It may become official on August 2.